People tend to forget the struggle of political ideologies which followed World War II (1939-1945). Until the final decade of the 20th century, this period was commonly referred to as "The Cold War". It was Democracy versus Communism, freedom versus tyrrany, a rush to build the most destructive and dirty Atomic Bomb, and a Race for Space once a rocket-powered delivery-system had been developed to deliver The Bomb. It became a competition to generate support technologies, delivery systems and electronic devices for rapid communication which were the least dependent upon humans and their errors and interference; it was a showcase for so-called "superiority". Television was in its infancy. Then, as now, the networks discovered cheap, live events to cover. One of these in the early 1950's was the on-going 1951 Senate Investigating Sub-committee on Un-American Activities under its chairman ..... Senator Joseph McCarthy [as we learned from the daily newspapers, which filled pages with the cheap transcripts]. The names of authors, directors and actors, who were paraded before the sub-committee, are legion. Slurs and accusations flowed before any testimony was taken. No-one could be represented by a lawyer. Questions could not be answered selectively, and many were forced to say, under the Fifth Amendment, "I refuse to answer the question on the grounds that I may incriminate myself." The appointment of Roy Cohn, as an investigator, by McCarthy was a signal that the entire "witch-hunt" had expanded into the realm of insanity. Cohn (with his sidekick David Shine) proved over and over that he had neither morals nor conscience as he sifted through "evidence", provided by those persons who testified in a forthright manner, in order to provide further nit-picking fuel for the investigations. Movies, which had been of the "patriotic type" during the war, continued certain "John Wayne" themes into the cold war. We did not learn about the extent of the damage until many years later. Careers and lives had been destroyed. Those involved in the Arts were suspect. As Lil Abner's Al Capp, the cartoonist, commented later, "This was not a time of joy in America" [meaning the United States of course]. Even Charlie Chaplin was attacked. Kirk Douglas broke the "blacklist" by putting Dalton Trumbo as writer of the screenplay in the credits for the film "Spartacus". Joe McCarthy pulled a gun out of his jacket and put it on his right knee during an interview on "Meet The Press" [... a quote from Late Night with Conan O'Brien, August 27, 1997]. The Senator, Joseph Raymond McCarthy, was born in 1900 in Alabama. He graduated from South-Western Alabama College in 1919, and was elected a judge in 1929. Southern Alabama did not suit his Republican political bent, so he moved North to Maine where he was elected to the House of Representatives in 1933 and to the Senate in 1948. Acquaintances said that he was looking for a cause through which he could further his ambitions. Few persons opposed him as he delivered blistering questions at subpoenaed witnesses in the style of a rabid prosecuter. Indeed, not many members of the sub-committee got a word in edgeways. The committee, however, adopted a mob mentality as it proceeded with its trials by inuendo rather than facts. McCarthy felt safe as he badgered witnesses (from the broad fields of the Arts) into admitting that they had belonged to such-and-such-organization which was known to espouse Communist ideals; he blustered at them when they refused to name the Communists in their groups or when they "took the 5th amendment to the Constitution of the United States". He attacked the news reporters and the magazines. Television was still in its infancy, and in very short order McCarthy discovered that he was a star. [He contracted the same fever as those exposed to publicity during the O. J. Simpson trial of 1994-1995 or the "Impeachment Hearings" dominated by a Grand Jury Hearing under "independent" Republican Kenneth W. Starr and another Republican-dominated Investigating Committee during 1998 -1999 at a cost of over 40 million dollars plus delays in that nation's business.] But television is neutral and, in McCarthy's case, it became his enemy ..... with the appearance in the witness chair of white-haired Judge Joseph N. Welch whose words, "At long last, have you left no sense of decency?" echoed through a hushed room. I've never considered Joseph McCarthy to be a "sitting duck", but we may very well have been the "sitting ducks" (or clay pigeons) if big brother U.S. had decided to blacklist us. Indeed, I considered "McCarthyism" fair game after the senator hired Roy Cohn when the scope of the committee expanded rapidly. I envisioned a cancerous spread of his witch-hunting tactics throughout North America. [Christopher Matthews, newspaper analyst for the San Francisco Examiner, put it rather succinctly on Wednesday, June 12, 1996, on the CBS Late Late Night Show with host Tom Snyder. He said, "Joe McCarthy was drunk most of the time, and he never found any Communists."] McCarthy was ruining the lives of some very talented persons, while many reporters and journalists like Chris sat on their hands and waited over forty years before they criticized the Senator. Fear was a significant ingredient used by the sub-committee to squash criticism. At Middle House residence of Victoria College (University of Toronto), we had just returned from a 1953 summer of work to pay for tuition, books and residence fees. The topic of the wild senate investigations was frequently discussed, since regular programs on TV had been replaced all too frequently by the cheaper spectacle of live hearings. (Yes, Virginia, the sub-committee had even started to turn upon the senate itself, anyone else involved in the U.S. government, the military and also the judiciary.) Three residents of Middle House --- Noré Flynn, Pete Grant and myself --- considered the possibility of a demonstration. Noré assumed most of the organizing responsibility (purchasing candles, matches, safety pins, et cetera). We swore everyone in Middle House to secrecy, and spread the plan to dress up in white bed sheets and pillow cases [the only material available in residences] at a Hallowe'en effigy burning. Perhaps Noré saw some possibilities of a parody on the KKK in these final moments of his planning, but it never came up as a topic within the group since the KKK has no significance in Canada's history. Eventually, the word of the event spread quietly to a few other residences (both male and female) on the Vic campus. On Friday, October 30, I was working as usual on scenery for the Bob Review, directed by Jim Wood of Middle House. This gave me a perfect cover for making a very sturdy hanging scaffold for the effigy, and as I noisily sawed and hammered away sure enough a curious policeman sauntered across the fields; I mentioned the annual Bob Review and invited him to preview the scenery and all of the activity within the Little Vic Gymnasium on the "Little Vic Football Field". Campus Cops were accustomed to these shenanigans, so the deluxe gallows was readied for the senator's effigy next night. (It should be pointed out that the home of the senior tutor of Burwash residence, Dr. C. C. Love, was immediately to the East of the Little Vic Field where I was labouriously sawing and hammering away on these 8" by 8" posts). It was a Saturday at midnight, and many students had gone home for the week-end or were sleeping. 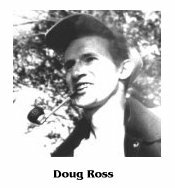 Marching from South House to North House up to the female residences on Bloor Street to Annesley Hall on Queen's Park (from residence to residence) shouting "Down with Joe", many other participants were enlisted until a crowd of about sixty-five proceeded to Little Vic Field. Regretfully, I was on the sidelines acting as a "traffic manager" when the main event took place. Not a bad turnout! 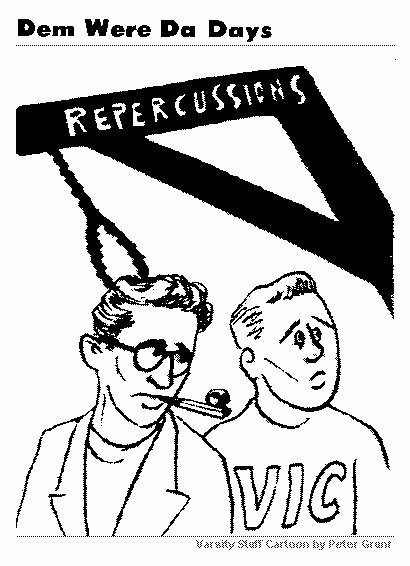 With his general artistic capabilities, Peter Grant put his talents to work by creating an effigy of the senator from his old Korean army uniform that night, and he also drew a cartoon of Noré and me with a noose over our heads for The Varsity newspaper. [Later that year, Pete was directly and indirectly responsible for additional appropriate dialogue and lyrics for Vic's Bob Review.] His cartoon on November 3 left no doubt about who smoked the aluminum pipe, often dressed in a turtle-neck sweater and wore glasses, easily identified by RCMP or CIA officers lurking in the Wymilwood coffee shop after a couple of newspaper articles of the previous day had reported that "the demonstration was organized by two arts students from Middle House". Pete's cartoon had implicated him, as well, in the planning of the event. Noré became quite upset with one fellow Middle House resident, Jim Sherbaniuk, who knew about the demonstration and was aware of the expenses. He made no offer to help out with the costs after selling one of his photographs to TIME MAGAZINE. Well, Noré fired off telegrams to Senator McCarthy, President Eisenhower and the U.S. Embasy in Ottawa. He criticised the fear tactics, and decried the fact that McCarthy symbolized the new style of American politics which had robbed the vitality of North American democracy. The telegrams were signed "students of Victoria College", as Noré explained to the President and Vice-Chancellor of Vic, Dr. A. B. B. Moore on Monday, November 2, without consulting other members of the planning trio. I believe that Noré felt that the event needed to be defused. Not all Vic students were involved, and he could say quite honestly that we had neither solicited College backing nor had our activities been represented in that light. Certainly, we did not wish to embarrass the Chancellor of Victoria College, the Honourable Lester B. Pearson, who was then Canada's Minister of External Affairs and active at the United Nations. In 1957, he would earn the Nobel Peace Prize for his involvement in the "Suez Crisis". As Prime Minister of Canada, he introduced the Canadian flag on February 15, 1965. We had not hurt his career, and nothing came of a rumoured investigation of those involved in the Hallowe'en effigy burning. In spite of those rumours, it turns out that President Moore and Principal Bennett seemed amused, if not pleased, by student involvement in the nasty current affairs of our neighbour to the South (USA, that is). Like logs clogging a river, the thought processes need to be jogged from their taciturn reverie occasionally so that the intellect may flow freely. The event of October 31st stimulated responses (pro and con) in all of the Toronto newspapers (The Toronto Daily Star, The Globe and Mail, and The Telegram) as well as papers and magazines in the USA. Shine some light upon those who perpetrate injustices, and the cowards slink back into the woodwork. A few articles hinted openly that we were the cowards. Our foe was in the USA and we were protected by our Canadian citizenship from the certain reprisals we would have received across the border. We were not untouchables, but most adverse comments, which came our way, sounded more like a case of sour grapes than criticism. None of us would enjoy having the McCarthy incident to be associated in any way with the plethora of demonstrations which ensued during the following decade. Many of these demonstrations seemed pointless, and the leaders and followers, alike, were often strung out on drugs. 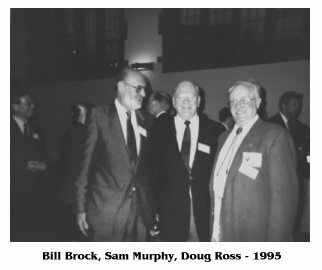 At the Burwash Reunion of 1995, one of the speakers mentioned that South House had been one of the hubs of the drug activity, and that there had been a few drug overdoses during the 1960's. Maybe we were naive when we believed that Canadians were immune from "McCarthyism", a term which came to stand for witch-hunting and the hurling of unfounded slurs. How wrong we were! Those were the days of innocence and gullibility. I could mention that Shirley Endicott, whose father was a United Church minister and Leader of the Communist Party of Canada, was a student at Old Vic when I was there. I never considered her (or her father) a threat to Canada but, if I recall correctly, she was not very sociable. In an article that she wrote later, Shirley said that she felt isolated and picked-on at Vic. Who knows? I also remember walking down to Massey Hall with Noré and Pete when the Red Dean of Canterbury came to Toronto that year. It seems that attendance was by invitation only, and we were soon ushered off the street by the Toronto Mounted Police Riot Squad. There it is. I never did get to meet or hear anybody with a non-Russian and non-Chinese version of the communism proposed by Karl Marx. At the Burwash Reunion of October 14, 1995, I revealed to Dr. Chris Love, the senior tutor of residence during the 1950's, that I had been one of the Middle House planners of the effigy hanging. According to him, U of T President Sidney Smith had received an inquiry about the effigy hanging. (The U.S. Embassy later denied that it was sent by them). Then Dr. Smith had referred the matter to Vic President Dr. A. B. Moore. Principal Bennett of Vic relayed the issue to chairman of the residence council Dr. C. C. Love (himself). Dr. Love said that the council "recommended that no action be taken in this matter". (As noted previously, Noré Flynn had probably told Dr. Moore that various telegrams had been signed "Students of Victoria College" and not "The Students of Victoria College" so that Vic could officially deny any involvement). 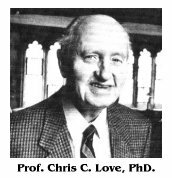 Dr. Love confirmed the opinion that there was a quiet approval of the Hallowe'en event as well as the publicity so long as the incident did not cause undue embarrassment to Lester B. Pearson, Vic's Chancellor and Canada's Minister of External Affairs, former Vic 1T9 graduate and a Don of Middle House. Quite early in his tenure, Dr. A. B. B. Moore found himself surrounded by controversy. In 1951, Victoria was still a member of the US-based Eastern Atlantic Association of Colleges. 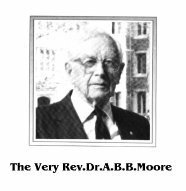 As head of his college, Dr. Moore received a letter asking him to appear before Senator Joseph McCarthy's House Un-American Affairs Committee, a letter he promptly threw into the wastebasket. He also was prompt in with-drawing Victoria's membership in the association in case it had hidden political agendas. A short time later, after the settlement of a long-standing feud with the Skulemen, Vic students relabelled a leftover engineer effigy "Joe McCarthy" and set it alight on the playing field. Dr. Moore believed that a United Press reporter happened to cover the occurrence --- and he remembered that from there, well, "all hell broke loose". The UP photo was printed in Time, under the caption "Communist College Burns McCarthy In Effigy." Hundreds of letters poured into Dr. Moore's office. "Most were too obscene to quote," he recalled. The US consul phoned as well, demanding that Dr. Moore report to him in his office. Dr. Moore responded, through his secretary, that he would be happy to meet with the US consul --- if the consul would care to come to Dr. Moore's office. No appointment was booked. Weighed against the brief thrill of defying the US government and standing up for his students and faculty was the certain embarrassment this incident could cause Lester B. Pearson (Vic 1T9), then Minister for External Affairs in the St. Laurent government. 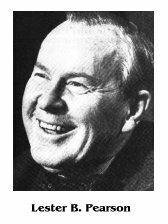 In his book, My Times, Pierre Berton, in one of many anecdotes, wrote about an interview with Lester B. Pearson on his program Close-Up. It was at the conclusion of an unprofitable association with Screen Gems. No matter. My connection with Screen Gems led to a new career. The company was interested enough in the five-minute spots to think of me in broader terms. We talked of several ideas for the coming season, and I realized I would be too busy to continue to handle assignments for Close-Up. My last appearance, in June 1962, caused considerable controversy and not a little fury. Near the end of an interview with Lester B. Pearson, then leader of the Liberal Opposition, I had asked a version of the "Better Dead than Red" question. Would he rather live under Nikita Khrushchev than suffer a nuclear war? His response stirred up a hornet's nest. It is hard now to recreate the passions of those times. The Red scare had reached its zenith. Almost every organization slightly to the left of centre was smeared with the Red tag. Pat Boone, the popular singer, had announced that if the communists took over, he would personally shoot all his children rather than have them live under a Red dictatorship. When I asked the question, Pearson gave a sensible answer: "Well, I want to do what I can to make that choice unnecessary, but if I have to make it, I would rather live under Mr. Khrushchev than die, and do what I could to throw him and his type out of power." For this Pearson was assailed as being "soft on Communism," and I was attacked for asking the question in the last ten seconds of the program. I felt uncomfortable about that. I hadn't realized the show was almost over, but of course I should have known; after all, that was my job. I wrote Pearson a note apologizing for throwing him a tough question with only seconds to spare. He responded graciously, saying there was no need to apologize, he understood the nature of the business and was always prepared to take his chances. The political party that attracts fringe lunatics is still alive and well, unfortunately. It is not surprising that one representative of that element could take over the Republican Party. Aye, Donald Trump was endured when all thought he couldn't get far with his abusive rhetoric and outright lies. Then, he became tolerated by the party as he began a circus of reality Television antics and started to win the primaries while opponents crumbled. The final step was reached when party regulars held their noses while supporting him as their candidate at the convention. I rarely give advice, but this is for Canadians who live and work in the United States of America. Stay there if you are a Republican/Conservative and, by all means, keep your guns. All others with artistic talent, inventive abilities or managerial expertise should seriously consider returning to the land of your heritage. Canadian Actors would be welcomed back to a flourishing film industry. Canadian scientists are on the cutting edge of their fields here and they are appreciated for their innovation. Canadian managers, who left to find lucritive careers in the USA, will find that their skills at creating jobs are in great demand back home. Get out before it's too late! PREDICTION (May 11, 2016): If Donald Trump becomes president while you are still there, the value of your property will plummet. The exodus will have passed you by. As a Canadian-born refugee, you may be placed at the front of a line which includes other talented individuals, but don't count on it. Forewarned is forearmed. Trump should also cease posting negative messages on Facebook, and stop the diarrhea of superlatives and hyperbole in his speeches. Neither of these deficiencies in his character will have beneficial effects. There was Remember the Alamo; then Remember Pearl Harbour; now it's Remember Charlottesville, Virginia, USA. 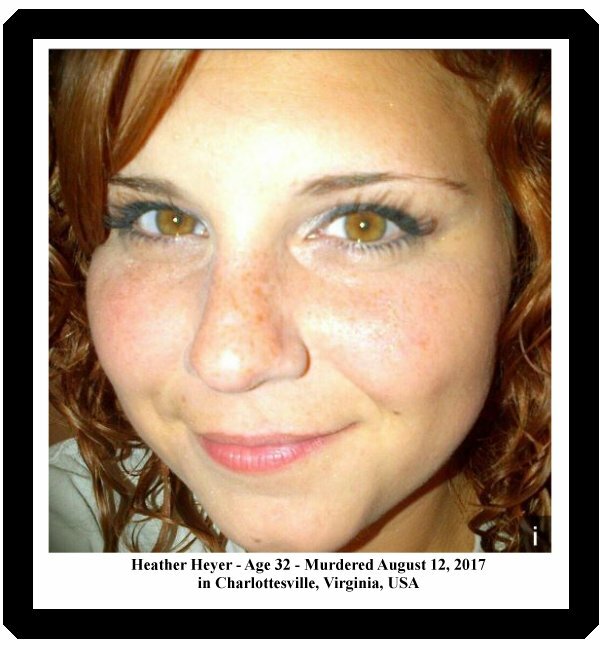 Heather became a martyr on Saturday, August 12, 2007, when moronic white supremists, neo-nazis, and KKK led a violent demonstration in normally peaceful Charlottesville. One of them ploughed into a crowd with his car in the style of an ISIS terrorist, injuring dozens of unarmed protesters and killing Heather (whose funeral was held today, Wednesday, August 16). Number 45, the president whom many now refuse to recognize, revealed his true self by equating the rabble extremists to the peaceful protesters whenever he delivered unscripted comments. This marks the beginning of Trump's implosion and self-destruction. I would be surprised if many Republicans speak out against him. Only the brave and judicious representatives will do so immediately (in a timely fashion). Meanwhile, Trump has done his utmost to damage the USA. When Trump's Council of Businessmen started to crumble, beginning with the resignation of six members including the chairman, Trump shut down the council before more resignations could occur. What can anyone expect from Republicans in the future? For one thing, they will continue to make it difficult for coloured citizens and impoverished people to vote. They are too predictable.